Courtmacsherry Lifeboat - Fáilte ar bord! The first lifeboat was established in Courtmacsherry in 1825 - one of the first to be founded in Ireland. 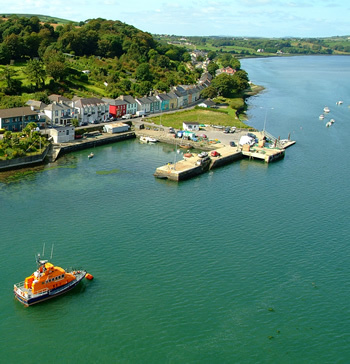 The lifeboat is very central to the life of Courtmacsherry and is very much part of the proud history and tradition of this beautiful seaside village. The station's current lifeboat is the "Frederick Storey Cockburn" - a "Trent" class lifeboat. This class of lifeboat was designed to lie afloat at a deep water mooring or at a berth. At Courtmacsherry the lifeboat lies approximately 100 yards offshore from the lifeboat station and is accessed by a small boarding boat. See our News page for the latest news and events relating to the Courtmacsherry Lifeboat. Courtmacsherry lies in beautiful West Cork - only a short drive (and yet a lifetime away) from Cork city. Courtmacsherry lifeboat station and its boats were paid for in the main from voluntary contributions by individuals and groups. Though the crews are fully trained by the RNLI to a very high standard, they are volunteers and do not charge for their time. To the West, Courtmacsherry is flanked by Baltimore Lifeboat station and its Tyne class All-weather lifeboat. To the East, is Kinsale Lifeboat station and it's Atlantic-75 class Inshore lifeboat. Courtmacsherry crews regularly exercice with these stations and have acted together on various shouts. We also co-operate with the Irish Coastguard. Directly to our East is the Old Head of Kinsale Coastguard station, then Summercove station followed by the Oysterhaven Coastguard station. Our Western flank is served by the coastguard stations of the Seven Heads, Castlefreake and Glandore. The RNLI's aim is to saved lives - but we need your help too. You can make a donation. You can arrange an event in aid of your lifeboat or you could consider becoming a crew member if you live close to Courtmachserry lifeboat station.